1933 Gloria Ten Special Saloon. One of the core aims of the club is to help keep as many of these cars on the road as possible and to return other, more neglected, examples to their former Glory. Therefore the club offers its members as much support and advice as possible when undertaking a restoration. From copies of period manuals from our Library or re-manufactured parts and secondhand spares. Within the network of members there is always someone willing to help and lend advice from personal experience. 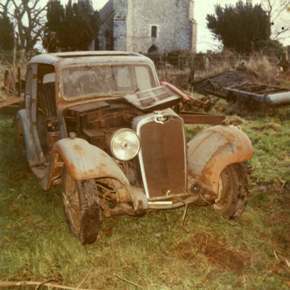 A 1935 Gloria 10.8 hp Coupe, before. On top of this, member Rob Green runs a professional restoration company, who has restored some of the best know examples of our cars currently on the road.